A customer is more likely to remember and consider a company when that brand has made a memorable impression. Companies spend a great deal of time and money investing in their brand and marketing that brand through logos and mascots using printed materials, online media and promotional products. Apparel branding is a unique way to customize a look that will make the first impression to your customers as they walk through the door. Chick-fil-A founder, Truett Cathy, valued not only his employees and the importance of a high-quality product but also the image of the Chick-fil-A brand. Everyone recognizes the “C” logo and “Eat Mor Chikin” cow as the Chick-fil-A brand. Cathy believed his executives and store operators should show the utmost professional image when serving the public. This was accomplished by a history of apparel branding from neckties to polo shirts. The original artwork for the first “Eat Mor Chikin” necktie was completed in 1996 by our very own in-house art department. 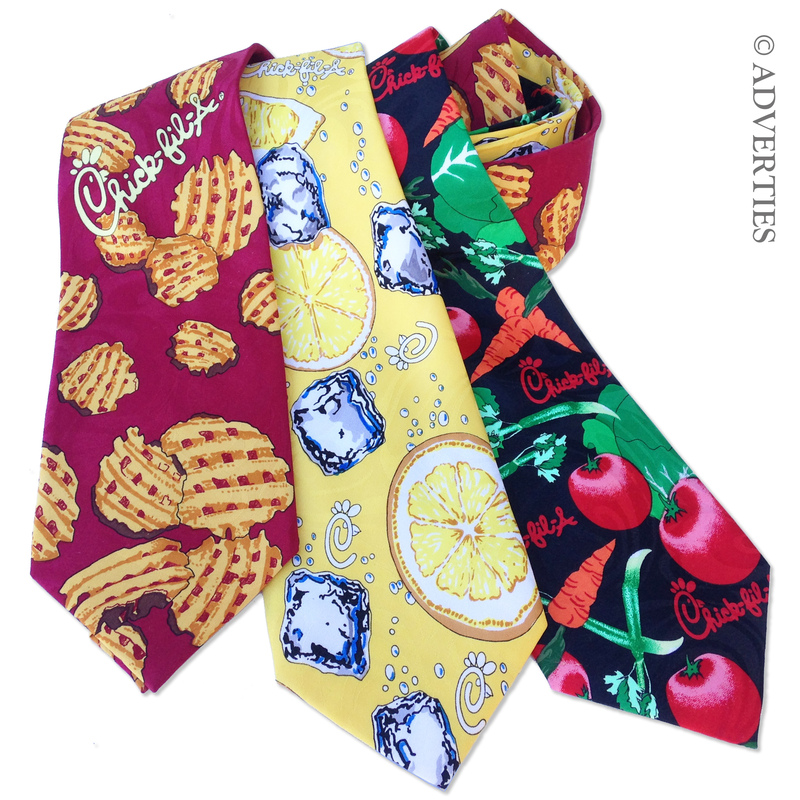 This kick started a line of fun collectible neckties designed to promote the Chick-fil-A logo, products and corporate partnerships. 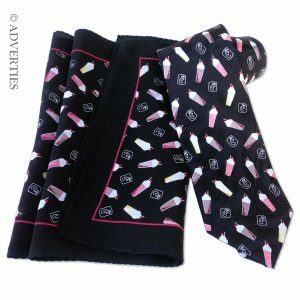 The uniform neckties became very popular with employees and many fans of the fast food chain looking to collect as many as they could. Some of these designs included renderings of their waffle fries, fresh-squeezed lemonade, crisp salads and creamy milkshakes. Uniform programs create a clean attractive look for businesses. Adding customized accessories such as neckties and scarves enhances a company and its brand. This is evident with airlines, hotels and restaurants looking to set themselves apart from the simple suit and collared shirt. Even adding just corporate colors to a pattern on silk fabric can add a professional look that helps customers identify who are there to help them. Any service driven industry can use apparel branding as the first impression to excellent customer service. Anastasia Lis has been the owner of Adverties Inc. since 1996. She has a background in business development. Her experience in marketing and graphic design have led to countless successful product designs.